Welcome to Corridor 17, the most challenging (and some say annoying) pilot trial this side of the Galaxy ! Come test your mettle and see how far along the corridor you can go ! 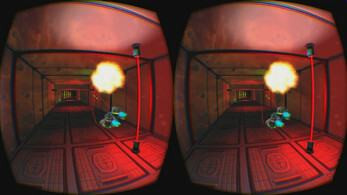 Corridor 17 is a mix between endless runner and shoot 'em up. 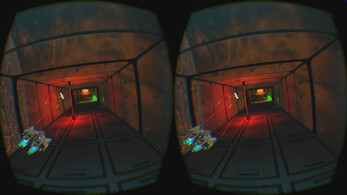 Your objective is to pilot your ship as far down the corridor as possible without dying. In your way are devious traps, obstacles and a mini (somewhat suicidal) robot army. Fear not though, for between your superior flying skills and laser marksmanship, this should be a walk in the park .... right ? Pilot your ship using the Oculus Rift DK2's head tracking capabilities. Dodge obstacles by leaning left/right and raising/lowering your head. 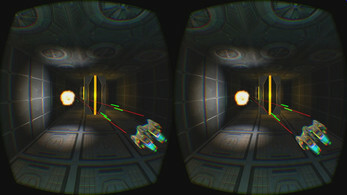 Aim your lasers using the mouse and hold down left-click to fire. For the speed junkies among us, we have also included "Turbo Mode" ! Give this a shot if the default flight speed puts you to sleep ! If the Oculus camera goes out of sync for some reason, pressing ESC will restart the level and re-calibrate your ship's position. or catch us on the Leap Motion forums. Thanks to the guys at Leap Motion for organizing this Jam ! This is our first attempt at indie game development and we probably wouldn't have gotten started at all if not for this opportunity. We'd also like to thank the following people who have contributed to our Jam submission in one way or another ! To our sponsors, thanks for loaning us Leap Motion Controllers and Oculus Rift DK2s ! To our play testers, thanks for helping us balance the game and contributing ideas. The game is a much friendlier experience thanks to you ! To the generous folks on the Unity Asset store, this game owes its visual aesthetics to you ! You rock !